Get high-quality rubber tracks and undercarriage parts at affordable prices. Daily shipments from our 8 warehouse locations means that you can often have your rubber tracks or parts delivered within one business day. This results in less downtime and ensures you stay on schedule. We won’t let something like broken rubber tracks keep you from completing your project. Dominion Rubber Tracks are available for mini excavators, compact track loaders, and tracked carriers. We also carry Yanmar, Toro, Furukawa, Caterpillar, and Bobcat tracks to name a few. These tracks are considered half pitch and constructed using a single steel cable. This ensures that there any no weak points in the rubber tracks and every sprocket tooth grabs a lug. The overall result is a smooth and comfortable ride. Our replacement undercarriage parts include a fully stocked line of sprockets, rollers, and idlers. Like everything else here at Dominion Equipment, our undercarriage parts are made with the highest quality control standards. We carry Bobcat, Kubota, Takeuchi, and CAT undercarriage parts. Click below to learn more about our undercarriage parts. 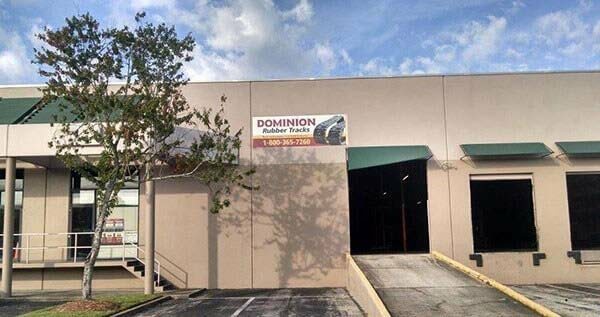 Founded in 1998, Dominion Equipment Parts is one of the nation’s leading distributors for replacement rubber tracks, replacement undercarriages, Morooka parts, Yanmar parts, and Fiori construction vehicles. We are proud of our products, services, and commitment to helping solve your equipment needs. Our goal is to remain a leader by offering only the highest quality rubber tracks with next day delivery to most locations in the United States. Need help? Give our Regional Sales Manager a call. 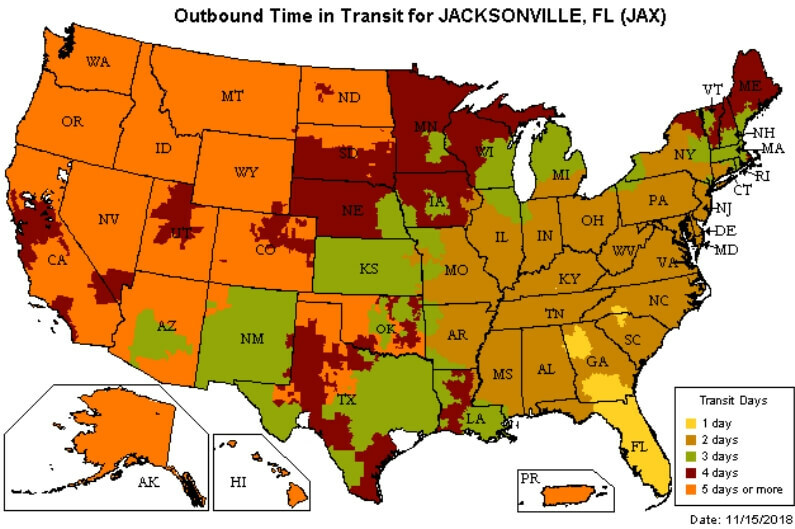 If our Jacksonville warehouse does not deliver to you area within 1 day, chances are that one of our other 7 warehouses does. For other warehouse locations click here. If you have any specific questions, please contact our Regional Sales Manager, John Vogt. John serves Florida, Georgia, Alabama, Mississippi, North Carolina, and South Carolina. Dominion Rubber Tracks are available for all mini excavators, compact track loaders and tracked Carriers. Our replacement undercarriage parts include a fully stocked line of sprockets, rollers and idlers, manufactured to the highest quality control standards. Dominion Equipment Parts is also the exclusive OEM parts distributor for Morooka Rubber Track Carriers in the United States, Canada, Mexico, Central and South America. *free shipping offer cannot be combined with any other offer, and free shipping is up to $200 on each order. Shipping is limited to business addresses only, residential delivery charges will apply.